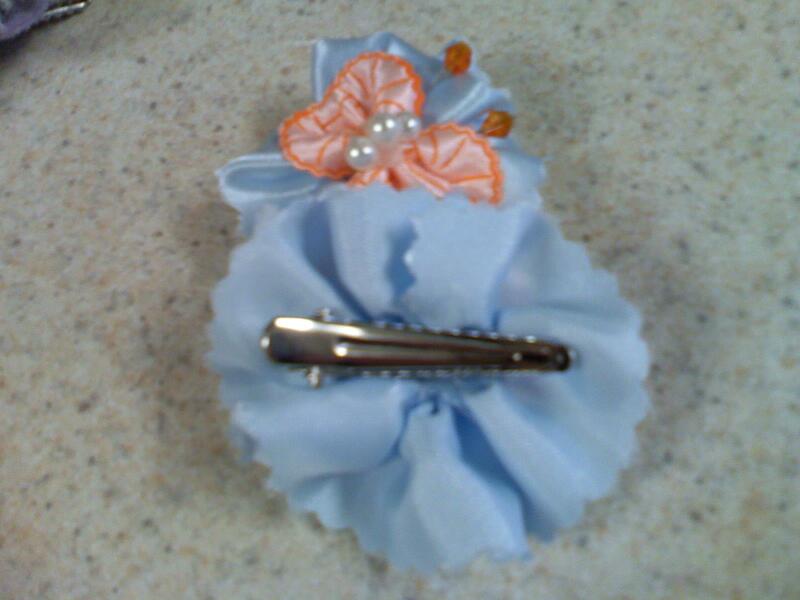 I saw the cutest bows that I have ever seen online. They're shaped just right so of course I immediately thought of butterflies. I thought I'd get some and see what I could do with them. This is what I came up with. You can pretty much use anything to set the butterfly on...lace or bits of fabric you might have hanging around. Some of the lace I already had on hand and some of it I bought just for this. 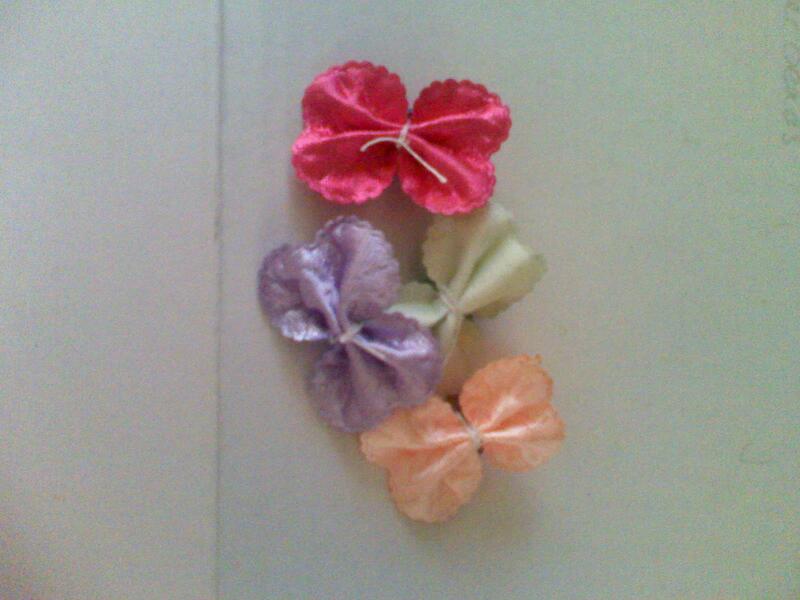 This is what they looked like when I bought them. You can see why I thought of butterflies. 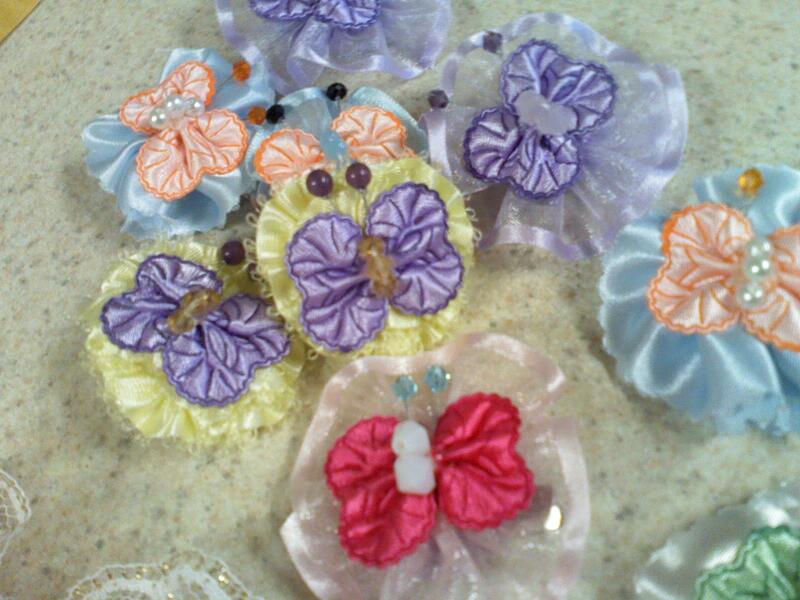 I sewed some beads for the bodies of the butterflies. 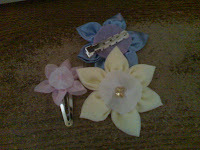 I used some crystal bi-cones and some glass pearls. I used either three 4mm or two 6mm. 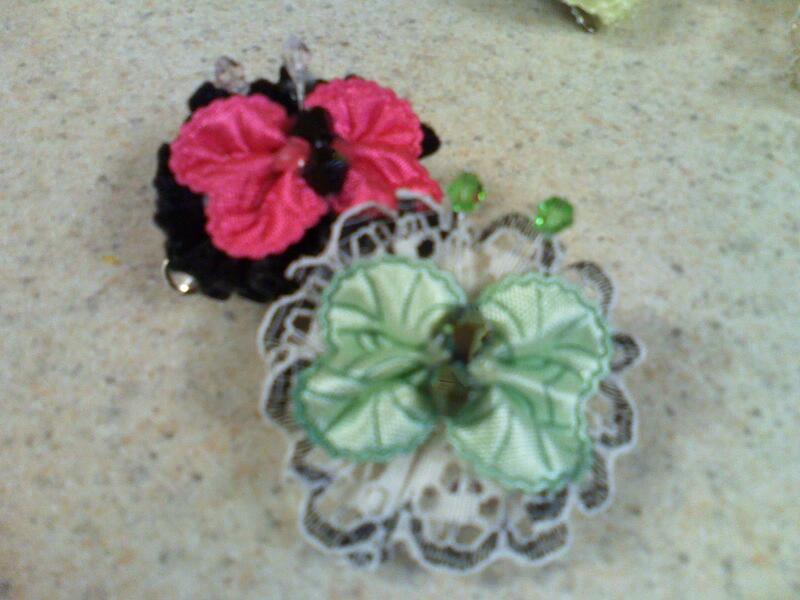 For the lace or ribbon behind the butterfly I made a running stitch and gathered it until I thought it would make a big enough circle. Stitch the ends together and there you have it. Fold in half, that's why they're double sided. The antennae was the hardest part for me to figure out. I cut some strips of beadalon for this, but you can use any beading wire. I dipped the ends in E-600 glue (careful, that stuff is super stinky and super toxic). 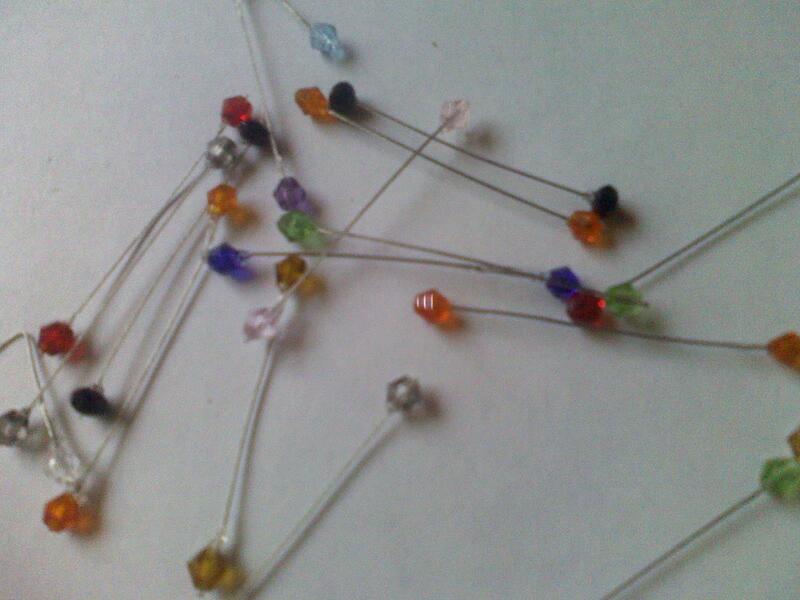 I used 4mm crystal beads for the ends. Bi-cones work the best. Some of them are rondelles and well, they look kind of like aliens....say, that might not be a bad idea. 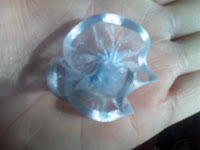 Use hot glue (the stinky stuff works real well for this part too but well, you know, hot glue doesn't smell as bad) to attach the antennae to the lace and then the butterfly on top of that. You can use these for embellishments for gifts, scrapbooking, or anything. I like to think that someday I'll do the scrapbook thing but I never do. 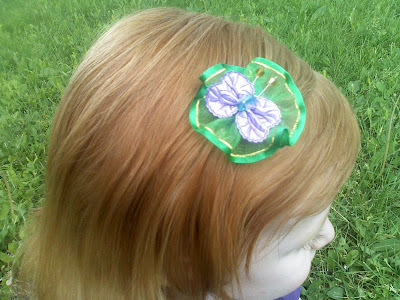 I actually put alligator clips onto the backs of them for my girls' hair. E-600 glue works best to attach clips. 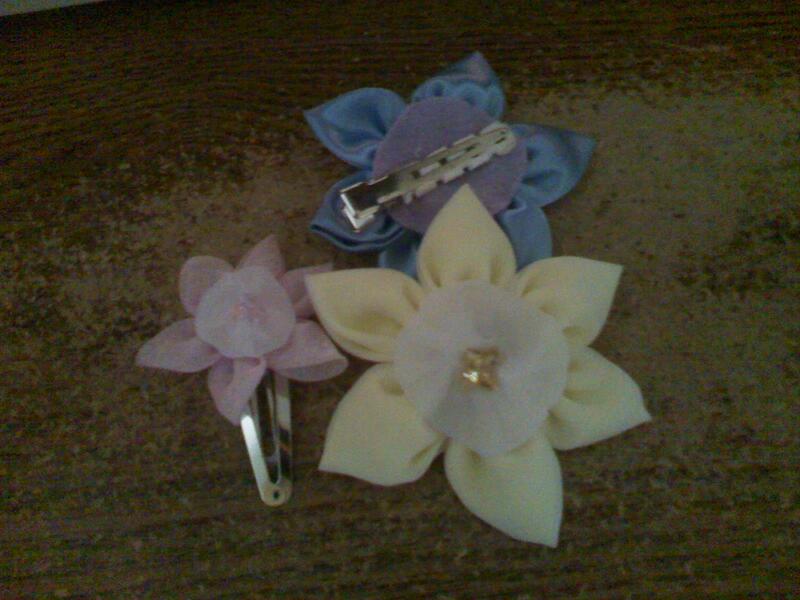 Coming up next are these cute flower clips so stay posted. Okay, I don't know how I've survived for this long without a permanent organizational thing at home. We've tried many different things and I have come to find that they were all very good ideas but I wasn't consistent and making sure we follow through. Now I know it's nobody's fault but my own, but I am going to change all that TODAY!! What with summer here...because the rain finally, FINALLY decided to take a break...I'm thinking we will go absolutely crazy if we don't do something and this, I think, will enable us to use our summer to be productive and have more time for the fun stuff. I can't stand wallowing our summer away in uselessness. Ya know? I cleared off a wall in my living room that I'm am going to use for charts and the kids can have their own kid friendly check off list along with a picture of their job when it's finished. As soon as I finish it I'll take a pic of the whole thing so you can see how I've done it. I'm still working out the details. I got a really cool hanging thing from Amazon.com and each of the children gets their own pocket. This one comes with 10 pockets and there are some with a lot more pockets but this will suffice and even allow extra pockets for other things. I'm still in the process of getting the chores list and the kid's check off lists finished. I'll let you know how that goes. So the wall is cleared off and we will put the first of the 'family center' stuff up but first.....we get to paint the wall. I think I'll let the kids help decide what color to paint that particular wall to help make it their own. Of course, I will help them decide on reasonable colors. If I leave it up to my 5 year old it'll be bright pink with butterflies on it or something. Hmmmm we'll have to see about that. I'll talk them into something reasonable. Wait! I have a better idea. Why don't I just choose the color? I'll paint tonight and post more tomorrow. 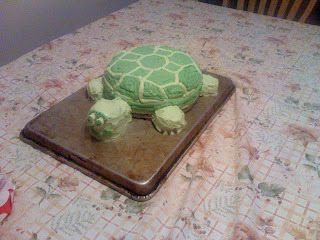 A sweet little girl I know..well not so little anymore-she just turned 10...loves turtles so I thought I'd try making a turtle shaped cake. I've never made a shaped cake before but I've layered them and decorated them before so how hard can it be, right? Now I'm no artist when it comes to drawing but I figured it would be pretty easy. So I looked online to find some turtle cakes and came across some pretty good looking turtles..if you can even call a turtle 'good looking'..but, you get my drift. I'll post the steps of how I achieved this uh...'good looking' turtle. I had some bananas getting pretty ripe and figured I'd make a banana cake. Mmmm I thought banana bread was good. This tops it by far. The recipe I found here. I didn't measure the bananas I just used three because mine weren't very big. I used my own frosting recipe and just kinda made up the filling recipe. I'll post those later. I didn't have any plates or trays big enough to hold it so I used the back of a sheet cake pan. Yup, put it straight on. 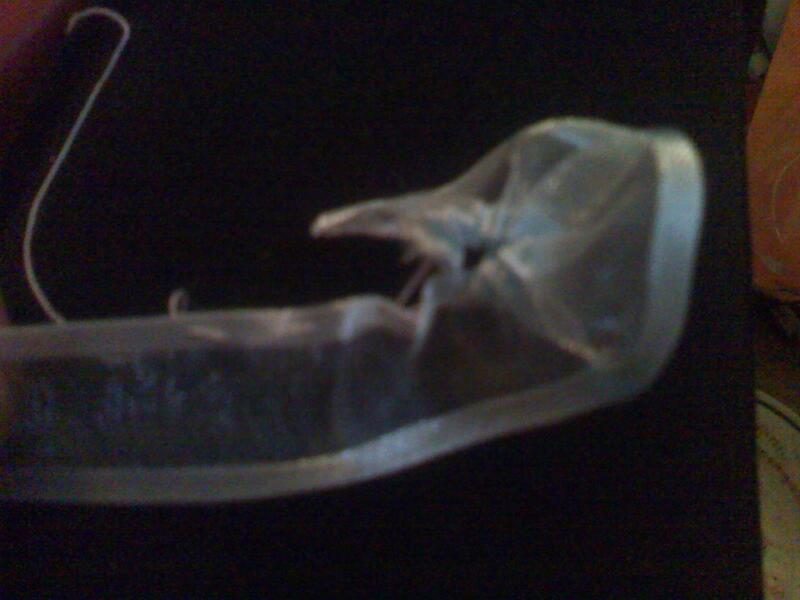 Looking at the pics afterward I'm thinking I should have at least covered the pan with tin foil or something. Oh well. I started with the frame of the turtle. A bit easier than I thought it would be. I need to learn photoshop. That little hand is my 5 year old daughter's. Had a hard time keeping her off the cake. 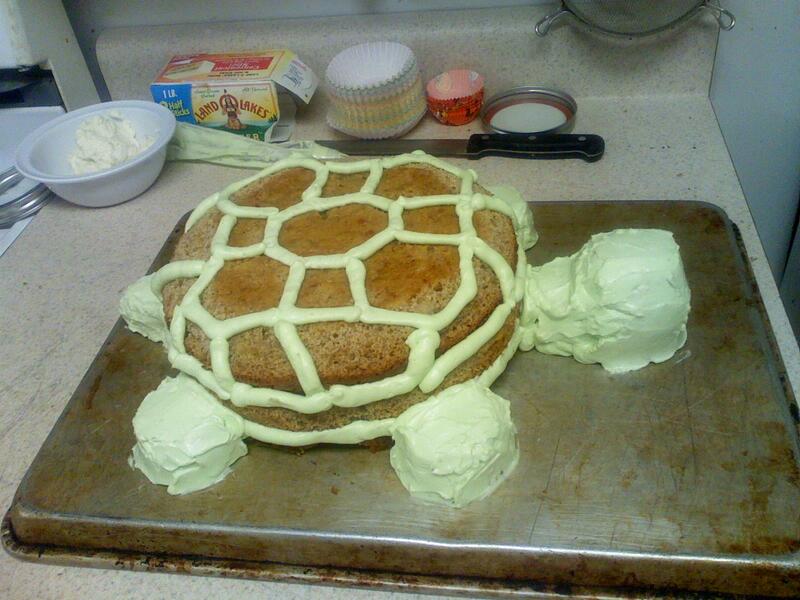 Freeze it first before frosting, trust me. After I froze mine and rounded the top layer I decided I should've put another layer on so I added one under the frozen layers. Didn't freeze it. It didn't trim as good. It was crumbly. So learn from my mistakes so you don't have to. Freeze first! The filling I used was a basic chocolate cream cheese frosting recipe with a banana blended in with it. I should have made more to eat myself. Like a pudding or something. Banana chocolate pudding...now that is good stuff. Oh my, Mr. 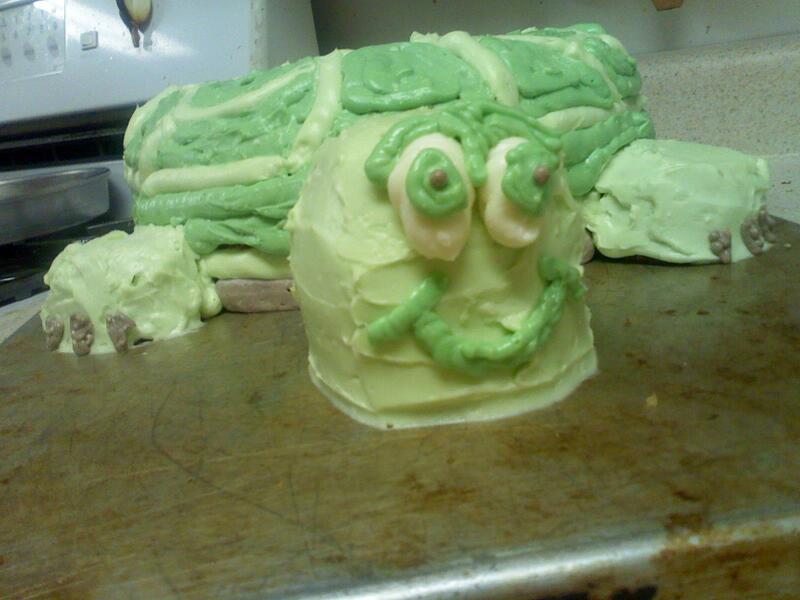 Turtle is on somethin'. I need to work on getting the frosting smoother. But who has the time when you've got more important things to do, like...eating cake? Once again the final deal. It was a good learning experience, for example, on how not to draw turtle faces. But she loved it and it tasted sooo good. Banana and chocolate, how could you possibly go wrong. I was going to take a close up of a sliced piece so you could see the yummy chocolaty filling but...well, we ate it. (Sorry Mr. 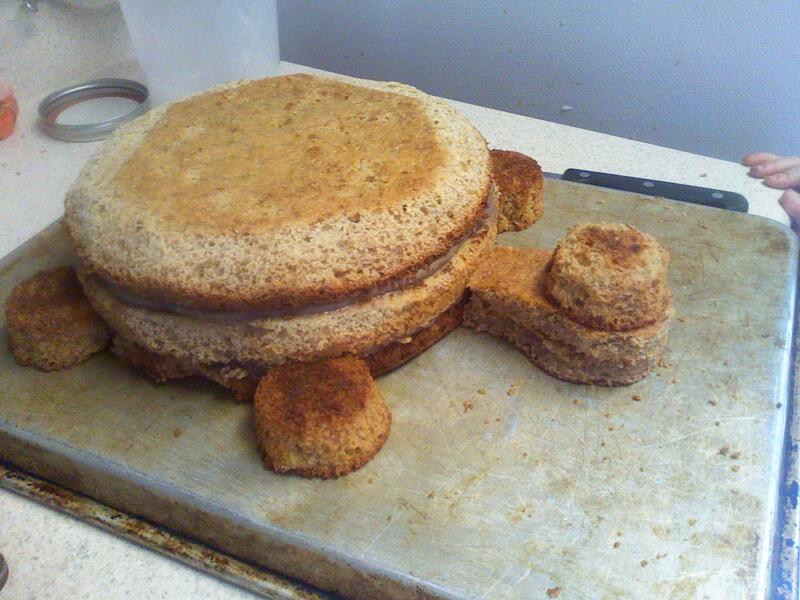 Turtle). I love everything, especially the early mornings. I like waking up before everyone else and just soaking in the moment. So peaceful and serene. I like to walk around on the cool grass without my shoes on. Hear it's good for ya, brings out the kid in me.